Intended for military use, ITW’s Tac Link is an accessory “attachment device” that provides many tactical advantages over common aluminum non-load-bearing carabiners. Luckily, you don’t have to be a soldier to buy or use Tac Links. I’ve been using one to attach my water bottle to my backpack for about two weeks now, and it also serves well as a lightweight handle. I’ll try it out for a few more tasks before I’m decide if it’s worth its $4 price tag. One thing has already become clear – Tac Links are strong and robust. 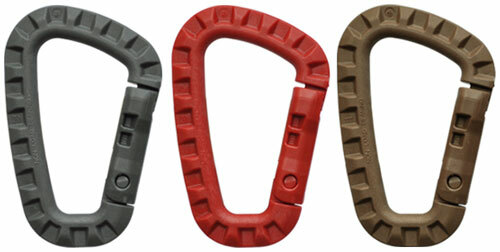 Heck, they’re like the T-Rex among keychain carabiners, and put all the rest to shame! You can find these at many tactical and EDC supply dealers for about $4-5 each. ITW GhillieTEX Tac Links are made in the USA!